﻿ Chile Cookbooks, Chilehead Gifts, and More! 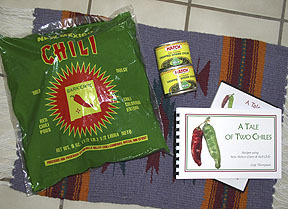 Everything you'll need to get you cooking like a native of New Mexico...our best-selling "A Tale of Two Chiles" cookbook and How-To video, a bag of high-quality dried red chile pods, and two 4 oz. cans of chopped roasted green chile, both manufactured in the heart of New Mexico chile country! While we very often cook chile recipes, we do occasionally like other dishes, and we especially enjoy Sunday Brunch at home. 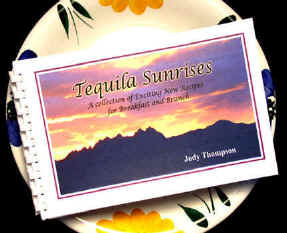 "Tequila Sunrises" is a collection of some of our favorite Breakfast/Brunch recipes, some of which do have a definite Southwest flavor. Here's a deal too good to pass up! 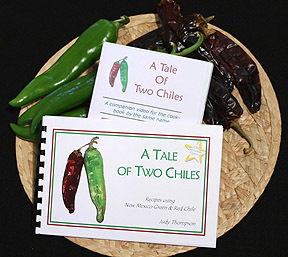 "Tale of Two Chiles" New Mexico cookbook and DVD! Note: Combo Deal only available with DVD video option. Note: Secure credit card payments are processed entirely by PayPal, so we never have access to your card information. A PayPal account is not required to pay by this method. At checkout you'll have the option of using either a PayPal account if you have one, or with your credit card. If you wish to pay by Check or Money Order, a mail-in Order Form is provided HERE.